Heat the oil in a large pot over medium heat. Add the finely chopped onion. When the onion begins to soften, add the diced pumpkin and stir for 5 minutes. Add the water, salt, red and black pepper. Put the lid on the pot and cook until the pumpkin is tender, about 15 minutes. When the pumpkin is done, mash it with a wooden spoon. Serve warm. I will definitely try this recipe next time when I cut pumpkin for pilaf. Is this a Turkmen dish? Thanks Kumiko! 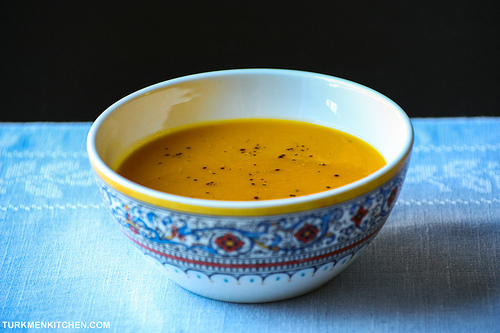 Yes, this pumpkin soup is an ancient Turkmen dish. I’ve never tried pilaf with pumpkin but seeing the photos on your blog makes me want to try 🙂 I’m impressed that you’re learning Turkmen! Made this last fall and loved it, and now i want to make it again with some pumpkin puree I’ve had in the freezer. How much would I use of the puree to get the right amount for this recipe, skipping the mashing step? Glad you like it! Sorry for replying so late but I tried this yesterday with a can of pumpkin puree (15 oz/425 g) and it worked well with the recipe. Also, definitely looking to trying more of these recipes. Thank you for your Website and great recipes!